The Standedge canal tunnel is the longest, deepest and highest canal tunnel in Britain. 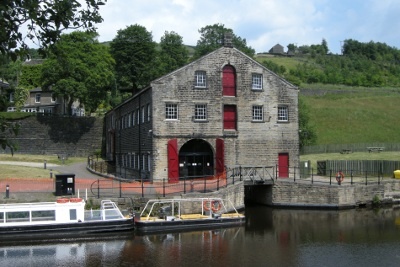 It was opened in 1811, closed in 1944 and then was reopened in 2001 as a part of the Huddersfield Narrow Canal restoration. 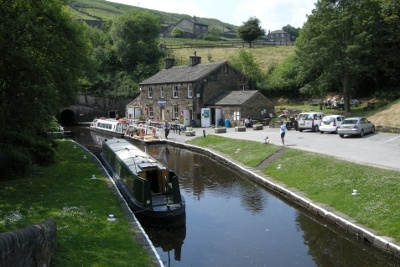 Marsden Tunnel end is at the Yorkshire side of the Standedge canal tunnel and has been developed into a tourist destination including a cafe, boat trips and a visitor’s centre. I have visited the area around Tunnel end, but it has been a long time since I have visited and this is the first time I’ve visited as a family day out with my children. Here are some of the main features of the site. There is a free car park adjacent to the Marsden mainline railway station. This is a 15 to 20 minute walk from the Marsden Tunnel end site along the canal towpath. There are also a small number of disabled parking spaces by the cafe and visitors centre. At the car park there is a free National Trust Visitors centre. This contains some displays and hands-on activities. It is only a small building, but worth spending about 15 minutes or so to explore. There are no toilets at the National Trust exhibition centre or car park (see later for locations of toilets). The tunnel end cottages are shown in the photo above. These house the cafe and a small shop and sell tickets for the boat trips. The cafe includes indoor seating. There are also some outdoor picnic tables located around the cafe and nearby area. We didn’t use the cafe as we took our own lunch with us, although we did purchase ice creams from the shop. I believe that the picnic tables, can be used for food not purchased from the cafe, at least we didn’t see any signs contrary and others were doing similar. There were also some colouring, toys and other activities that could be used on either the picnic tables outside or on tables inside the shop area. There are toilets and baby changing available within the tunnel end cottages. The Standedge Tunnel Visitors Centre is a building close to the tunnel end cottages. There is a maintenance dock in the middle of the building with some exhibits and activities located around. This includes history of the canal and tunnel and some hands on games and toys. The visitor centre is free to enter and appears to be mostly unstaffed allowing visitors to use at their leisure. The visitors centre also has toilets inside. The highlight of the visit to Marsden was the boat trip into the tunnel. The trip lasted for about half and hour. The glass topped boat drives into the tunnel for about 15 minutes and then reverses back out again. There is a guide that describes the way that the canal and railway tunnels were built and also showed some of the tools used passing them around to look at. If you are feeling a little more adventurous you can sit in the open front part of the boat, wearing a hard hat for safety reasons. We sat in the front for the first half of the trip and then went inside for the journey back out again. The tunnel is not lit, but there are lights on the boat. The boat lights were turned off briefly whilst stationary, but we were warned about it and the staff did have torches. Children were given a certificate to say that they’d been in the tunnel. Once a month there is also a passenger boat which goes through the full length of the tunnel. If your children enjoy going on a boat trip then it’s well worth a visit to Marsden tunnel end. It”s a shame that there is not an outdoor children’s play area, but there are several indoor activities including colouring and indoor games. This entry was posted on Thursday, July 15th, 2010 and is filed under General. You can follow any responses to this entry through the RSS 2.0 feed. Both comments and pings are currently closed.